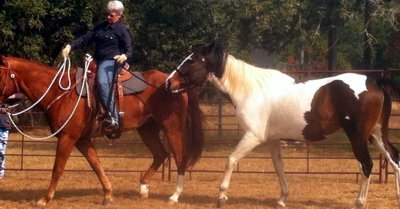 If your horse exhibits one or more of these symptoms and you have not been able to determine the underlying cause, you may want to have your vet do a simple blood test provided by Bio-Medical Services Lab (www.bmslab.com). This blood test can help you determine whether your horse is allergic to certain foods. The basic food panel for horses includes apples, soybeans, oats, barley, corn, wheat, molasses, flax, and beet. Horses that test positive for a single food may have a true allergy unless that food is the only one on the list that they have ever been exposed to. Horses that test positive to multiple foods may be dealing with acquired food sensitivities that are caused by the incomplete digestion of food before the food is absorbed into the bloodstream. Horses are often unable to completely digest their food because of the unhealthy bacteria in their gut, which interferes with the digestive process. If the horse also suffers from intestinal ulcers (or a breakdown of the intestinal lining), proteins may be absorbed into the bloodstream before they are properly digested. The horse’s body then interprets these larger protein molecules in the bloodstream as foreign invaders, which triggers an immune response locally or even systemically. Because of this immune response, the body is now “allergic” to any foods that contain these types of proteins. This condition is also called leaky gut syndrome, and the intestinal ulcers (as opposed to stomach ulcers) may be caused by the overuse of NSAID’s such as bute or banamine. These drugs decrease the protective mucous layer in the intestine. Plan to feed these products for only a few months because your horse may develop sensitivities to them as well during this healing period. These products can be reintroduced later if needed once the gut has healed and enough time has passed that the immune system is less reactive to them. If your horse is symptom-free after six months you may carefully add the original offending food or foods back into the diet one at a time. If this goes well then you can assume the original problem was food sensitivity rather than a true allergy. If symptoms return you will need to once again remove the offending foods from your horse’s diet, this time for a longer period. If this approach fails you may have to remove those foods from the diet permanently. If symptoms persist even after the offending foods have been removed from the diet, your horse may also be sensitive or allergic to his hay, pasture grass, or weeds. It may be necessary to control his diet very carefully until your horse is completely free of symptoms. I believe food allergies and, more commonly, sensitivities are the cause of more problems than we realize. In my experience horses most frequently test positive to wheat or corn. You cannot rely on the labeling on commercial feeds to provide detailed information about feed content since most simply list “grain products” as the main ingredient. If your horse tests positive for any of the foods previously listed I suggest you design your own ration and remove all formulated supplements and treats from the diet. You may also have to stop natural supplements and herbal products for a period and introduce them back into the diet one at a time. Allow at least two weeks before introducing a new product. My own mare is allergic to wheat and I can tell within three days if she has sneaked a bite of another horse’s ration because she gets sore for girthing. If I watch her closely or separate her at feeding time the symptom goes away. Since removing wheat from her diet she has gained weight and is working more consistently. In her case I feel she has a true allergy and I will never intentionally feed her a product containing wheat. Much to her dismay, this ban includes her favorite cookies!